Adira Rosen as Peter Pan and Julia Price as Captain Hook in the J*Company production. Peter Pan takes flight again. Well, sort of. The J*Company Youth Theatre’s imaginative artistic director, Joey Landwehr, has found myriad ways to make it look like petite, sprite-like Adira Rosen, 15, is airbound. It’s quite convincing, as is Adira’s portrayal. Her Peter is bold and vain and self-congratulatory; she sings well, acts well and moves well. It’s a knockout performance. Also noteworthy in the cast of 90 (yes, 90!) is Gabi Leibowitz as Wendy, another 15-year-old — a beauty with a wonderful voice and lovely stage presence. Jonas McMullen stands out as Wendy’s brother John, and Julia Price is deliciously over-the-top as Captain Hook. There’s even a walking, furry crocodile (in a suit worn by a cavorting Etan Acks). I went in with the music from the Mary Martin version of “Peter Pan” in my head. That’s the one by Mark “Moose” Charlap, with additional music by Jule Styne and lyrics by Carolyn Leigh, with additional lyrics by Betty Comden and Adolph Green. That’s the one I grew up with and loved (the one with “I’m Flying,” “I Gotta Crow” and “I Won’t Grow Up”). It was created by some pretty heavy hitters in musical theater. About the same time, Disney produced an animated version, also based on J.M. Barrie’s “Peter Pan, or The Boy Who Wouldn’t Grow Up” (1904 play; 1911 novel). The memorable numbers here are “Never Smile at a Crocodile” and what became a Disneyland ‘Pirates of the Caribbean’ staple, “A Pirate’s Life.” The score is attributed to 11 different composers/lyricists including, for most songs, the legendary Sammy Cahn and Sammy Fain. That motley crew makes for a bit of inconsistency in the songs; some are more memorable than others. The kids are all impressively committed; even the littlest ones are earnest about the choreography (Erin Petersen). Musical director Susan Huniu keeps them on their toes, too. The set (Kai Linden, who also designed the lighting) is seemingly simple yet effective, with a large rotating centerpiece (moved by the cast) that changes effortlessly from the Darling children’s bedroom to a pirate ship to the hideout of the Lost Boys (who are somewhat oddly dressed as animals, “for camouflage”). Overall, the costumes (Shulamit Nelson) are excellent. The sound design, while proficient with ambient noise, failed to sufficiently amplify several of the weaker voices. I so missed the audience participation of “Clap if you believe in fairies” to bring Tinker Bell (ballet dancer Joanne Barber) back to life. But for added humor, Landwehr stuck in a number of local and Jewish references, not to mention a plug for the J*Company’s next show, “The Pirates of Penzance” (Jan. 16-25), and his own face amusingly wedged into Mt. Rushmore. Landwehr even added some cultural sensitivity by throwing in the line, “Braves don’t even talk like that,” about the pidgin English of the Indians. In a brisk two hours (including a 20-minute intermission), Landwehr and company tell the tale of Peter Pan with panache. It’s a fun outing for the whole family. The little ones in the audience especially loved Hook’s crazy/goofy laugh. Adult theatergoers appreciated the talent — and the talent it takes to marshal 90 bodies onstage. Quite an undertaking, excellently executed. 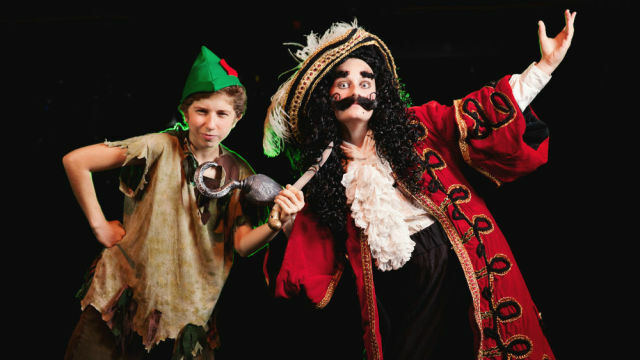 The J*Company Youth Theatre‘s production of “Disney’s Peter Pan” runs through Nov. 9, in the David and Dorothea Garfield Theatre at the Lawrence Family Jewish Community Center, Jacobs Family Campus, 4126 Executive Drive, La Jolla. Performances are Saturday at 8 p.m., Sunday at 1 p.m. and 4:30 p.m.